I found very cute confectionery items at a supermarket, so I decided to give them away!!! The gel pens are with tiny edible silver glitters. They won't get hard. Instead of using gel pen, you can use jam, of course. 1. Sift in all the dry ingredients in a large Ziploc bag. Add butter, make sure it is zipped, then mix well. 2. Roll out the dough in the Ziploc bag to 5mm (0.2 inch) thick. Refrigerate the dough for at least 1 hour to set and chill. 3. Preheat the oven to 170C (338F). 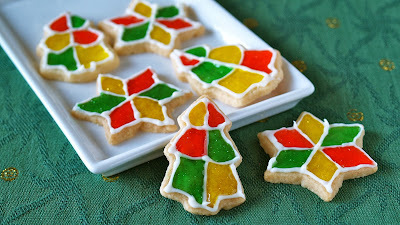 Cut out the dough with cookie cutters. Place the cookies on a cookie sheet lined with parchment paper. Roll out scraps, and repeat. 4. Bake at 170C (338F) for about 15 minutes. Cool the cookies on the sheet or a wire rack. 5. Melt the chocolate pen or some chocolate in a pastry bag. Snip off the end and trace the outline of the cookies. Then divide each into 6 sections. Put them in the fridge to set. Fill in each section with gel pens or jam of your choice.